It’s 1996. Teenage Alex languishes in his garage den, imagining a future of travel and sunshine in a bid to escape the ordinary. Money is his only hurdle, until double glazing salesman, Fox, enters his life. Empty days are soon filled with knocking on doors, the nights spent drinking in seedy pubs with his boss and the sales team as he gets to know their secrets. 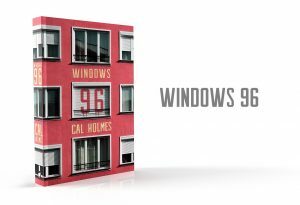 A classic coming of age tale in the cheap but flashy world of double glazing, Windows 96 is an amusing, yet insightful look into not only the character’s lives, but human nature. Readers who miss the buzzing vibe of the nineties, as well as those who enjoy well-written character-driven stories, will follow Alex on his road of good intentions until the final page.